BRILLANT CRAFTSMANSHIP IN PHENOMENAL HIGH RELIEF! -- Each coin begins as a hand-selected one-ounce planchet of highly pure 99.99% fine silver. Then, the artisans at the Perth Mint strike each coin multiple times with polished, curved dies. The result is a high relief proof with sharp, frosted details that tower over a deep, concave field gleaming with a mirror-like surface. AUSTRALIAN LEGAL TENDER -- Each 2018 1-oz Silver Wedge-Tailed Eagle High Relief Proof is one dollar Australian legal tender. All the details are engraved on the obverse along with Ian Rank-Broadley's profile of Her Majesty Queen Elizabeth II. 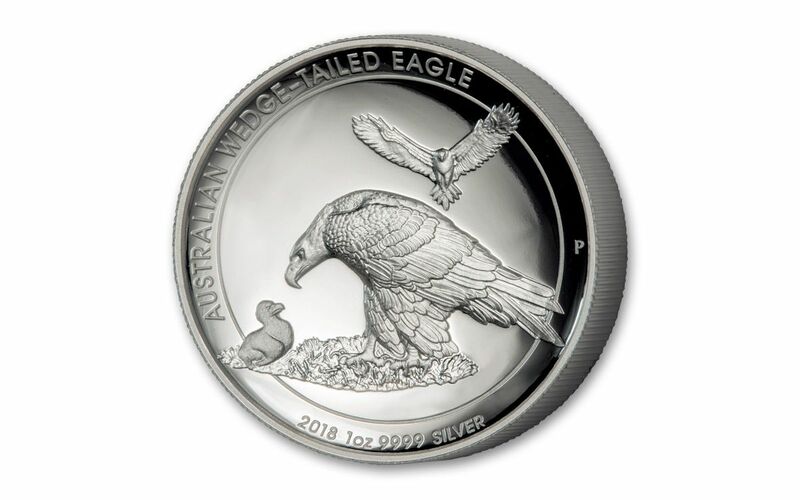 The coin's silver content, the year 2018 and the signature "P" mintmark join the wedge-tailed eagle family on the reverse. SUPERB ORIGINAL MINT PACKAGING -- Your 2018 1-oz Silver Wedge-Tailed Eagle High Relief Proof will arrive to you exactly as it left the Perth Mint, secured in a presentation case and accompanied with a numbered certificate of authenticity. A LIMITED MINTAGE EVENT -- The Perth Mint has set the mintage of these Wedge-Tailed Eagle High Relief Proofs at exactly 10,000! That's right - there are only 10,000 of these proofs for Wedge-Tailed Eagle collectors around the world! 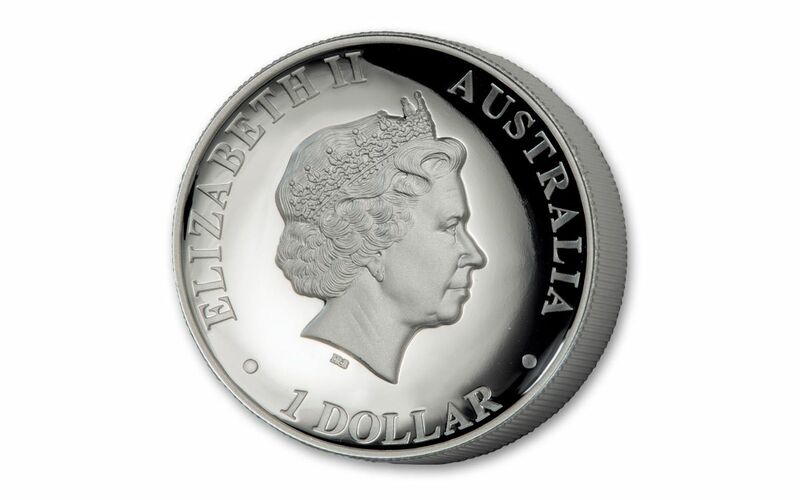 And, unless you live in Australia, your ONLY source for this stunning silver coin is GovMint.com. The entire Wedge-Tailed Eagle series has been a global hit since 2014, and we're expecting this installment to soar right out of our vaults. 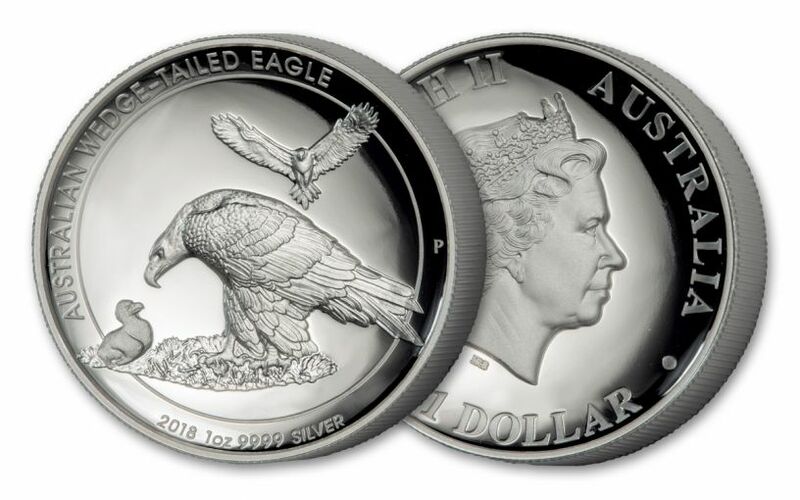 Don't wait another moment -- add this 2018 1-oz Silver Wedge-Tailed Eagle High Relief Proof to your collection today!